Picture yourself having just acquired an old master print (say, a Rembrandt etching) at an auction. The print is in a exceptional good state, and you bought it at a reasonable price (“reasonable” meaning in reasonable relation to the size of your wallet, of course). After the auction, this well known old print conaisseur which you watched lingering around the specimens shown at the pre-sale exhibition approaches you and tells you with that calm voice expressing a life full of old master print expertise: “Madam/Sir, I have to to tell you: your print has been Schweidlerized“. Schweidlerized? What does he mean? The print was sold (at an auction etc.) at a much higher price than what it is actually worth. Read on for the solution and the rediscovery of a tremendously valuable book. 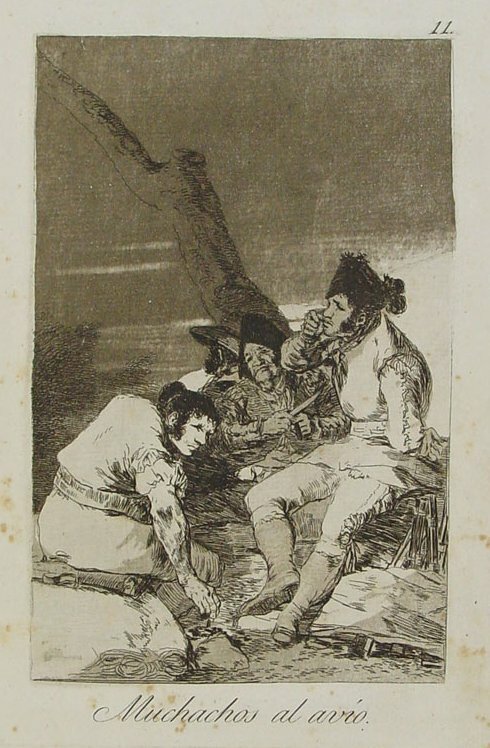 An early impression of the aquatinta etching “Muchachos al avío” (“Lads making ready”) by Francisco de Goya was found in the kitchen of the former residence of Slobodan Milosevic in Beograd. The plate 11 of the series “Los Caprichos” has been confirmed to be a first impression, published in 1799. The plate had been part of the collection of former President Josip Broz Tito, for whom the residence originally was built. At the moment it is both unclear how it got there and what the wherebouts of other “disappared” items from the mentioned collection are. 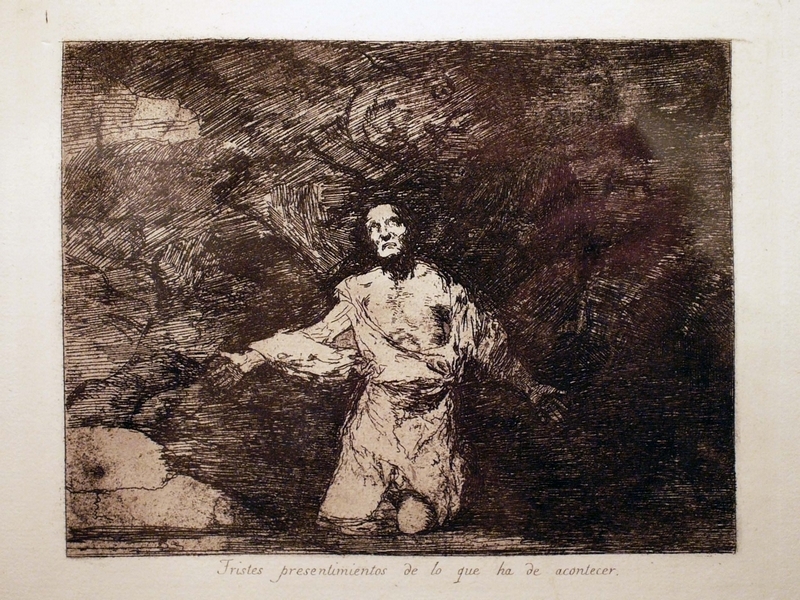 The etching “‘Tristes presentimientos de lo que ha de acontecer” (“Sad presentiments of what will happen”) by Francisco de Goya (1746-1828), which was stolen a month ago at an important Goya exhibition at the Fundación Gilberto Alzate Avendaño in Bogota, has been found in a hotel room in the same city, still in its original frame. The etching is part of the series “Los desastres de la guerra” (Disasters of War) (1810-14) narrating the hardships of the Spanish liberation war against France. Link to an article showing the corpus delicti (14.10.2008). This and some other articles erroneously speak of “engravings”, although the Disasters of War prints are etchings (with the additional use of aquatint, dry point and burin). The use of “engraving” instead of “etching” seems to be a common mistake for news agencies, it happened also here. “I spotted it and immediately knew that was the kind of thing I wanted: “The Agony in the Garden”. It was really a stunning piece. You could see the expression on Jesus’ face, how passionate it was. It’s above my bed.” Those are the words of Brahm Wachter, who bought this original Rembrandt etching at the 2003 Maastricht art fair (click on the thumbail to the left for a full size version of the etching). Now this alone probably wouldn’t be enough in order to be mentioned in todays art market news, weren’t there the fact that the collector was 13 years old at that time he bought it with his bar mitzvah money. While market and investing oriented magazines like Forbes interpret this as the start to a successfull art investing career, I see it rather as the first steps of an art passionate, or an “art amateur” (from Latin amare, to love); despite the fact that Brahm is the son of George Wachter, worldwide head of the old masters department at Sotheby’s. 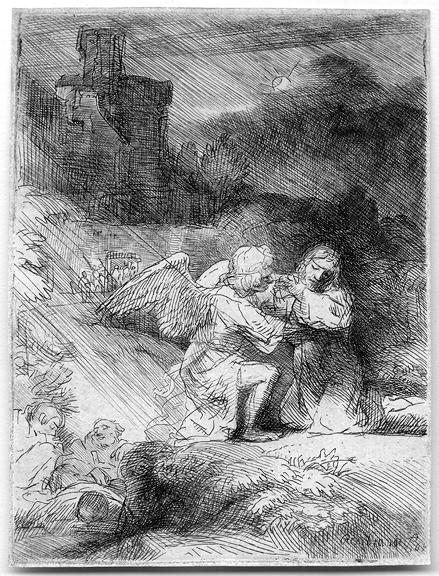 An etching by Rembrandt van Rijn, “Adam and Eve” (click on the left picture to see an enlarged version), has been stolen from an art gallery in Chicago. The suspected thieves are a couple who had briefly entered the gallery and left it, taken the etching with them. The etching dates from 1638 and is worth around 60’000 US$. In some news articles the stolen print is labeled as “an engraving”, which is not correct. It is an etching. When you have a closer look at the full size version (click on the small picture above), you will discover a nice detail in the background: a small elephant. 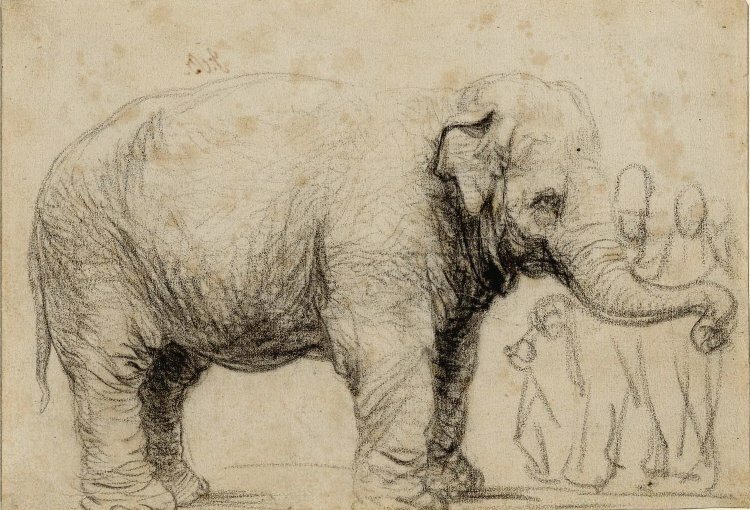 It is Hansken (1630-1655), an elephant which was shown across Europe in the 17th century. An anonymous copper engraving from the 17th century shows Hansken’s manifold skills, which may also have impressed Rembrandt to include her (Hansken was a lady elephant) in a scene from the Bible. Rembrandt stolen from Mag Mile gallery (Chicago Tribune) and followup. On the reverse of the engraving and etching “Silence” by French engraver Laurent Cars (1699-1771) after the painting by Jean-Baptiste Greuze (1725-1805), a handwritten inscription was found. The only thing I found out so far was that it is in French, and that it starts with “Cette epreuve…” (“This proof…”). If anybody is able to provide a transcription, I would very appreciate it. Click on the picture below too see a full-sized version of the inscription. Laurent Cars after Jean-Baptise Greuze: Silence! Note: This started as a reply to a comment of an earlier post ; since one can’t easily add formatting, pictures etc. in a comment, i decided to publish it in form of a post. Nicolas (1739-1792) and his brother Robert (1754-1854) Delaunay (sometimes also referred to as De Launay) were both active as engravers/etchers in Paris. Nicolas, pupil of Louis-Simon Lempereur (1728-1808) and later entitled to Graveur du Roi (“Royal Engraver” of Louix XV), was one of the contributors of engravings to the 1773-83 edition of J. J. Rousseau’s Oeuvre Complètes (Complete Works) after designs of Jean Michel Moreau (also called Moreau le Jeune). One of Nicolas Delaunays most popular compositions after Jean-Honoré Fragonard (1732-1806) is Les hasards heureux de l’escarpolette (“The Happy Accidents of a Child’s Swing“). Artheque cites also La bonne mère as one of his “big” compositions.